court reporting Carmel California | Todd Olivas & Associates v3.0 | Court Reporting Services in Orange County, Riverside, San Bernardino, San Diego, Los Angeles, Irvine, Santa Ana, San Jose, Sacramento, Fresno, San Francisco, Bakersfield. TO&A employs no court reporters, interpreters or videographers of our own. The providers we send are fully qualified and reliable independent contractors. Welcome to Carmel! We're proud to have access to one of the best deposition-taking environments anywhere in town. If you're looking for a deposition suite that facilitates a quality court reporting, interpreting and videography service -- look no further! If you want your deposition to be in a venue away from the ordinary and into the extraordinary, let us book you in the beautiful and inspiring village of Carmel-By-the-sea., simply called Carmel. Located on the Monterey Peninsula in Monterey County, CA, Carmel sits like a jewel along California’s central coast. TO&A Carmel Court Reporting is situated in the Hofsas House Hotel just 8 blocks from the picturesque white sand of Carmel Beach. There is plenty of off-street parking, even though this is a community where locals and guests abandon their cars to experience the village on foot. 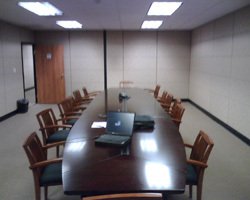 The meeting/deposition room is fully furnished and equipped with the latest audiovisual technology you require. Our professional and friendly TO&A support staff will provide for your litigation needs. After hours, take some time to watch a glorious sunset over the Pacific Ocean, or stroll the village and it’s hundreds of shops, art galleries and restaurants. You will be refreshed in this quaint, costal enclave, world-reknowned for its combination of European charm and San Francisco sophistication. To schedule a Carmel Court Reporter, please schedule online or call (888) 566-0253. We'll provide you with a freelance court reporter, interpreter, and videographer in Carmel, California. The court reporters we send are state licensed (where applicable), and always prompt and courteous. Our goal is your complete satisfaction which is why we only work with the best court reporters available. Our interpreters are all certified, all languages -- and be sure to tell us which dialect you need if it's an exotic language.